Does proposition (1) – that the “total factor payments received for producing a given volume (or value) of output are necessarily sufficient to purchase that volume (or value) of output” – mean the total factor payments received before the sale of a given volume (or value) of output? (3) all factor payments to owners of goods rented (e.g., land or property rent). * another issue is: are money loans and interest on money loans a further cost of production? In other words, the question is: how did the Classical economists define profit and is it included in Say’s law? If proposition (1) means total factor payments received before the sale of a given volume (or value) of output, then, with many prices set above costs of production to allow profit, it cannot be true that total factor payments are necessary to purchase that total volume of output – unless the aggregate value of losses on goods sold (where prices are below costs of production) equals the aggregate value of profits. But, in modern economies, most prices are set as a mark-up on total unit costs and are generally not adjusted to clear markets: that is, mark-up prices do not fluctuate around costs of production, but will generally be set above total unit costs. The price adjustment required in Say’s law does not normally happen. The issue is also interesting because, in Classical economics, the “equilibrium price” (or natural price) is assumed to be the cost of production price (however this is defined), towards which all prices gravitate. But, if a real world price is really a cost of production price, then the normal “equilibrium prices” of Say’s law would mean owners of capital get no profits. In short, are total factor payments received for producing a given volume of output defined as (1) ex ante (before actual sales) alone or (2) ex ante and ex post payments (before and after the actual sales of those products)? (2) if total factor payments are ex ante payments (before sales) alone, then there is no reason why total factor payments should be necessary to purchase the aggregate volume of output if most industries earn profits by charging prices above costs of production, unless, once again, one assumes a grossly unrealistic tendency to general equilibrium in the real world where aggregate value of losses equals the aggregate value of profits. so there is no logically necessary nor empirical reason to think Say’s law would ever hold in the real world. Steve Keen gives a lecture below on mainstream economic theory and the austerity in Europe, in a talk in Vienna. Some very interesting interviews here with Philip Pilkington on economic methodology, aggregate demand and various other subjects. Entitled Thoughts: Philip Pilkington on Modern Economic Methodology, Part 1. Harcourt and Turnell (2012a : 35) argue that Roy F. Harrod, James E. Meade, W. Brian Reddaway and David Champernowne all found a type of IS-LM model in the General Theory. This is an interesting subject, and a starting point is the discussion in King’s A History of Post Keynesian Economics since 1936 (2002), pp. 30–32. First, King notes that Keynes’ heart attacks and his burden of work related to the Second World War stopped him from making systemic, point-by-point responses to all the controversy caused by the General Theory (King 2002: 30). Others have noted that Keynes’ response to interpretations of the General Theory was to encourage and support any favorable treatments as a pragmatic and tactical move. King notes that Keynes “never once repudiated the IS-LM interpretation of the General Theory” but “endorsed it warmly” (King 2002: 31), although Kriesler and Nevile have pointed out in their paper “IS-LM and Macroeconomics after Keynes” (Kriesler and Nevile 2002) that the early IS-LM models of Roy Harrod and W. B. Reddaway were not exactly the same as that of John Hicks (1937). Keynes wrote a letter on 30 August 1936 to Roy Harrod, commenting on Harrod’s paper “Mr. Keynes and Traditional Theory,” Econometrica 5.1 (1937): 74–86. I like your paper (may I keep the copy you have sent me?) more than I can say. I have found it instructive and illuminating, and I really have no criticisms. I think that you have re-orientated the argument beautifully. I also agree with your hints at the end about future dynamic theory. (1) I have been much pre-occupied with the causation, so to speak, of my own progress of mind from the classical position to my present views,--with the order in which the problem developed in my mind. What some people treat as an unnecessarily controversial tone is really due to the importance in my own mind of what I used to believe, and of the moments of transition which were for me personally moments of illumination. You don’t feel the weight of the past as I do. One cannot shake off a pack one has never properly worn. And probably your ignoring all this is a better plan than mine. For experience seems to show that people are divided between the old ones whom nothing will shift and are merely annoyed by my attempts to underline the points of transition so vital in my own progress, and the young ones who have not been properly brought up and believe nothing in particular. The portholes of light seen in escaping from a tunnel are interesting neither to those who mean to stay there nor to those who have never been there! I have no companions, it seems, in my own generation, either of earliest teachers or of earliest pupils; yet I cannot in thought help being somewhat bound to them,--which they find exceedingly irritating! (2) My second point is, perhaps, part of my first. You don’t mention effective demand or, more precisely, the demand schedule for output as a whole, except in so far as it is implicit in the multiplier. To me the most extraordinary thing, regarded historically, is the complete disappearance of the theory of demand and supply for output as a whole, i.e. the theory of employment, after it had been for a quarter of a century the most discussed thing in economics. One of the most important transitions for me, after my Treatise on Money had been published, was suddenly realising this. It only came after I had enunciated to myself the psychological law that, when income increases, the gap between income and consumption will increase,--a conclusion of vast importance to my own thinking but not apparently, expressed just like that, to anyone else’s. Then, appreciably later, came the notion of interest being the measure of liquidity-preference, which became quite clear in my mind the moment I thought of it. And last of all, after an immense lot of muddling and many drafts, the proper definition of the marginal efficiency of capital linked up one thing with another. (3) You do not show how in conditions of full employment, which I should now like to define as the limiting case in which the supply of output schedule ceases to be elastic, my theory merges in the orthodox theory. Given that Roy Harrod is sometimes credited with anticipating the IS-LM model of Hicks, Keynes’ praise is suggestive, and Barens (1999) argues that Harrod’s model in “Mr. Keynes and Traditional Theory” was a correct interpretation of the model in Chapter 18 of the General Theory. But, as other Post Keynesians have pointed out, in Chapter 18 of the General Theory, Keynes played down the role of uncertainty (which he had stressed in Chapter 12) and, if he had really maintained the crucial role of uncertainty, as he did later in his fundamental article “The General Theory of Employment” (1937), this would have “ruled out any stable functional relationship between investment and the interest rate” (King 2002: 14). That the door was thereby left open in Chapter 18 for neoclassical synthesis Keynesians to reformulate the General Theory as a general equilibrium model like IS-LM where the interest rate has a pivotal role, as King (2002: 14) notes, does not mean that either Chapter 18 or IS-LM is compatible with other aspects of Keynes’ thinking. It is, furthermore, interesting to note that Kriesler and Nevile (in “IS-LM and Macroeconomics after Keynes,” pp. 4–5) argue that Harrod’s model in “Mr. Keynes and Traditional Theory” was not quite the same as that of Hicks, but has a number of differences, not least of all that Harrod’s was not a clear-cut Walrasian general equilibrium model and also that Harrod did discuss expectations, unlike Hicks. In 1936, W. B. Reddaway published a review of the General Theory (“General Theory of Employment, Interest and Money,” Economic Record 12 : 28–36). In a footnote, Reddaway produced a model that is fundamentally similar to Hicks’ IS-LM, but Keynes in a letter to Reddaway (Keynes 1973: 70) seems to have had no specific objections to it or the review generally (Harcourt 2012b : 295). In a letter commenting on a draft of J. R. Hicks’ famous paper “Mr. Keynes and the ‘Classics’; A Suggested Interpretation” (Econometrica 5.2 : 147–159), where IS-LM was developed, Keynes did not reject the model, but said that “I found it very interesting and really have next to nothing to say by way of criticism” (Keynes 1973: 79). Unfortunately, I have not had the time to chase up and read the full copy of Keynes’ letter. Some have actually argued that Keynes’ reaction to Hicks’ paper was only “lukewarm” (Kriesler and Nevile, “IS-LM and Macroeconomics after Keynes,” p. 4). Others think that Keynes did have reservations about the ability of the model to represent the crucial role of expectations. “In this connection Mr. Robertson refers with approval to an article by Dr. Lange which follows very closely and accurately my line of thought. The analysis which I gave in my ‘General Theory of Employment’ is the same as the ‘general theory’ explained by Dr. Lange on p. 18 of this article, except that my analysis is not based (as I think his is in that passage) on the assumption that the quantity of money is constant.” (Keynes 1938: 321, n. 1). Lange’s article “The Rate of Interest and the Optimum Propensity to Consume” (1938) was the first serious application of the IS-LM model (King 2002: 103). In Pigou (1937), the latter defended the real balances effect against Keynes, and Kaldor (1937) was a response to this. Keynes published Kaldor’s paper in the Economic Journal, and on p. 752–753, footnote 2, Kaldor used Hicks’ IS-LM model: Keynes did not seem to object to the use of this model. As King (2002: 31) notes, the problem with all this is that it sits uncomfortably with Keynes’ later thinking on uncertainty and expectations, particularly in his 1937 article “The General Theory of Employment” (Quarterly Journal of Economics 51.2: 209–223). Moreover, at the same time that Keynes was praising the IS-LM interpretation of the General Theory, he also endorsed the emerging heterodox interpretations of it too (King 2002: 32). If Keynes was also supporting non-general equilibrium interpretations of the General Theory, then there is a clear problem with saying that Keynes gave some explicit and consistent support for IS-LM. One can only conclude that Keynes gave mixed signals on this subject and his thinking was not entirely coherent. But this can also be said of the General Theory itself. “Only one question needs to be answered to make the case complete. Why did Keynes give it [sc. the IS-LM model] his cautious approval in 1937? Kriesler, Peter and John Nevile. “IS-LM and Macroeconomics after Keynes,” p. 7. A final point to be borne in mind is that, while many Post Keynesians think IS-LM is worthless (and indeed the problems with it are devastating), others (who may well be in a minority) argue that a suitably reformulated IS-LM model has some analytical value: Harcourt and Turnell (2012a : 35) argue that a type of IS-LM model can capture “Keynes’s most abstract model in which short-term expectations and long-term expectations are assumed to be independent of one another, and short-term expectations are assumed to be realised immediately ... .” (Harcourt and Turnell 2012a : 35). Of course, one would assume that such an abstract model does not really describe the real world, but is an analytical tool only. Finally, does anyone know where there is an online complete copy of Keynes’ letter to John Hicks, 31 March, 1937, in which Keynes discusses the draft of J. R. Hicks’ famous paper “Mr. Keynes and the ‘Classics’; A Suggested Interpretation” (Econometrica 5.2 : 147–159)? Steve Keen, “Modelling Economic Balance like it’s 1975,” 27 March 2013. “Misinterpretations in Mainstream Economics,” February 19, 2013. “Debunking Economics, Part VIII: Macroeconomics, or Applied Microeconomics?,” August 26, 2012. Barens, I. 1999. “From Keynes to Hicks – An Aberration? IS-LM and the Analytical Nucleus of the General Theory,” in Peter Howitt et al. (eds. ), Money, Markets and Method: Essays in Honour of Robert W. Clower. Edward Elgar, Cheltenham UK. Cord, Robert. 2013. Reinterpreting the Keynesian Revolution. Routledge, London. Dillard, Dudley. 1990. “Interpreting Mr. Keynes: The IS-LM Enigma,” History of Political Economy 22.3: 582–584. Harcourt, Geoffrey Colin and Sean Turnell. 2012a . “On Skidelsky’s Keynes,” in Geoffrey Colin Harcourt, On Skidelsky’s Keynes and Other Essays: Selected Essays of G.C. Harcourt. Palgrave Macmillan, New York. 13–58. Harcourt, Geoffrey Colin. 2012b . “Reddaway, [William] Brian, 1913–2002,” in Geoffrey Colin Harcourt, On Skidelsky’s Keynes and Other Essays: Selected Essays of G.C. Harcourt. Palgrave Macmillan, New York. 294–304. Harrod, R. F. 1937. “Mr. Keynes and Traditional Theory,” Econometrica 5.1: 74–86. Hicks, J. R. 1937. “Mr. Keynes and the ‘Classics’; A Suggested Interpretation,” Econometrica 5.2: 147–159. Kaldor, Nicholas. 1937. “Prof. Pigou on Money Wages in Relation to Unemployment,” The Economic Journal 47.188: 743–753. Keynes, John Maynard. 1937. “The General Theory of Employment,” Quarterly Journal of Economics 51.2: 209–223. Keynes, John Maynard. 1973. The General Theory and After. Part II: Defense and Development. The Collected Writings of John Maynard Keynes. Vol. XIV. Macmillan London and Basingstoke. Lange, Oskar. 1938. “The Rate of Interest and the Optimum Propensity to Consume,” Economica n.s. 5.17: 12–32. Moggridge, D. E. 1976. John Maynard Keynes. Penguin Books, New York. Pigou, A. C. 1937. “Real and Money Wage Rates in Relation to Unemployment,” The Economic Journal 47.187: 405–422. Robertson, D. H. 1938. “Mr. Keynes and ‘Finance,’” The Economic Journal 48.190: 314–318. Young, Warren. 1988. “Interpreting Mr Keynes: The IS-LM Enigma,” The Economic Journal 98.389: 214–216. L. Randall Wray is interviewed on the Thom Hartmann Program below. The interview ranges over quite a few issues, including Piketty. The graph below shows the top US federal marginal tax rates on (1) earned income (in red) and (2) (where it diverges from the latter) ordinary income (in blue), from the the data here. 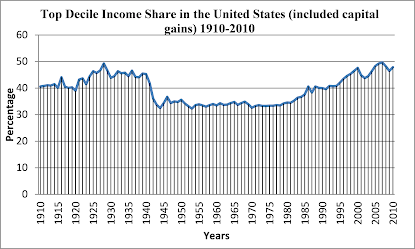 This is a large part of the story of rising US income inequality. 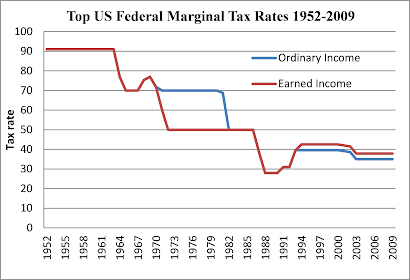 (1) from 1933 to the early 1940s the top marginal tax rate was progressively increased from about 60% to about 90% to fund the war effort, and stayed at 90% until the Kennedy–Johnson tax cut of 1964. (2) the Kennedy–Johnson tax cut of 1964 reduced it to 70%. 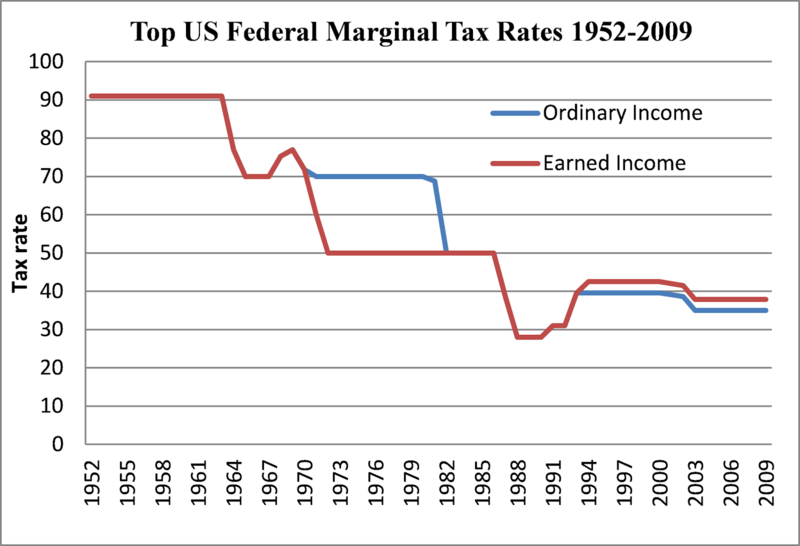 (3) then under Reagan’s presidency the top marginal tax rate on ordinary income was reduced to 50% in the Economic Recovery Tax Act of 1981 and to 30% in 1988. (4) subsequent changes have been minor, and the rate has fluctuated in a range from 30 to 40%. Two Summaries of Bewley’s Why Don’t Wages Fall During a Recession? Truman Bewley’s Why Wages Don’t Fall During a Recession (1999) is an excellent empirical study of the causes of downwards nominal wage rigidity and how and why wages are set in modern capitalist economies. Robert Nielsen, “Why Wages Don’t Fall During A Recession,” December 23, 2013. Bewley, T. F. 1999. Why Wages Don’t Fall During a Recession. Harvard University Press, Cambridge, MA. Hamouda and Harcourt (1988; reprinted in Hamouda and Harcourt 2003) provide a review of the history of “broad tent” Post Keynesian economics and its various strands, and a response to the charge that Post Keynesian economics is not coherent. Hamouda and Harcourt (1988: 1) note that in the late 1980s Walrasians like Frank H. Hahn and neoclassical synthesis economists like Robert Solow had a poor understanding of Post Keynesian economics and were not clear about what its theories involved. They furthermore noted that “Post Keynesian economics” was itself an expression referring to heterogeneous groups in several strands (Hamouda and Harcourt 1988: 2). The first “route” runs from Classical economics to the British marginalist Alfred Marshall, and then to John Maynard Keynes. Keynes inherited his early economic thinking from Marshall, but emancipated himself from Marshallian neoclassical ideas in the General Theory and later work. An important American Post Keynesian strand developed as inspired from the work of Keynes and included Sidney Weintraub, Paul Davidson, Jan Kregel and Hyman Minsky. Lorie Tarshis was also a North American Post Keynesian who independently developed a Keynesian macroeconomic theory that was developed from the work of Keynes, Richard Kahn, Joan Robinson and even Gardiner Means (Hamouda and Harcourt 1988: 6). The second strand is the neo-Ricardian or Sraffian group. Piero Sraffa’s work is foundational for this strand, and that in turn was influenced by Classical political economy and Ricardo, or least Sraffa’s reinterpretation and reformulation of it. Sraffa’s work was developed by later Sraffians/neo-Ricardians such as Pierangelo Garegnani, Krishna Bharadwaj, John Eatwell and Luigi Pasinetti, who introduced the Keynesian principle of effective demand into his theories. The third group runs from Classical economics, via Marx, to Michał Kalecki. Kalecki was the important modern figure here, but, though influenced by Marx, was an unconventional Marxist and rejected the labour theory of value. Kalecki developed a theory of effective demand, but using the ideas of mark-up pricing and social conflict as the determinant of wages (Hamouda and Harcourt 1988: 13). Hamouda and Harcourt (1988: 14) see Joan Robinson and her followers as developers of this Kaleckian tradition in Post Keynesian economics. Hamouda and Harcourt (1988: 18–19) also see Paolo Sylos Labini as having contributed to the Kaleckian strand of Post Keynesian theory. Hamouda and Harcourt (1988: 3) also identify a number of “outstanding individual figures” who are not easily classified into one of the strands listed above: for example, Nicholas Kaldor, Luigi Pasinetti, Richard M. Goodwin (Hamouda and Harcourt 1988: 23), George L. S. Shackle, and Wynne Godley (Hamouda and Harcourt 1988: 23–24). The final point that Hamouda and Harcourt (1988: 25) make is that it is within each strand that coherent approaches and macroeconomic theories have been developed. “… within the various strands that we have discerned and described, there are coherent frameworks and approaches to be found, though obviously there remain within each unfinished business and unresolved puzzles. The real difficulty arises when attempts are made to synthesize the strands in order to see whether a coherent whole emerges. Our own view is that this is a misplaced exercise, that to attempt to do so is mainly to search for what Joan Robinson called ‘only another box of tricks’ to replace the ‘complete theory’ of mainstream economics which all strands reject. The important perspective to take away is, we believe, that there is no uniform way of tackling all issues in economics and that the various strands in post Keynesian economics differ from one another, not least because they are concerned with different issues and often different levels of abstraction of analysis. An important implication of the above conclusion is that the policies which may be rationalized by post Keynesian analysis are very-much geared to concrete situations, the historical experiences and the sociological characteristics of the economies concerned. More generally, this approach which was that, for example, of Keynes, Kalecki, Joan Robinson and Arthur Okun, sometimes and most appropriately, has been dubbed the ‘horses for courses’ approach.” (Hamouda and Harcourt 1988: 25). Of course, Hamouda and Harcourt wrote this article in 1988, and one could well argue that, since that time, there has been a convergence to some extent between the various strands, but also the emergence of new strands such as modern monetary theory (MMT). Chapter 2 of Colin Rogers’ Money, Interest and Capital deals with Wicksell’s monetary theory. Wicksellian monetary theory was widely accepted in the period before Keynes’ General Theory, and indeed Keynes himself accepted the natural rate of interest in the Treatise on Money. The real natural rate of interest lies at the heart of Wicksell’s version of loanable funds theory, and links Wicksell’s capital theory with his monetary theory (Rogers 1989: 22). Wicksell’s monetary theory was an attempt to extend the quantity theory to an economy with credit money and loans (Rogers 1989: 23). Wicksell’s theory of capital was in turn developed from the work of Jevons and Böhm-Bawerk (Rogers 1989: 27). Wicksell consequently argued that all capital goods can be regarded as “saved up labour and land” (Rogers 1989: 29). When the money rate of interest at which demand for investment credit and the monetary supply of savings is equal, there is a monetary equilibrium rate. And, when this monetary equilibrium rate is also equivalent to the expected yield on new capital, then the money rate of interest and the real Wicksellian natural rate of interest are equal (Rogers 1989: 39). Rogers argues that the Cambridge capital critique applies to Wicksell’s theory of capital, and that it has proven that Wicksell’s natural rate of interest is untenable outside a purely abstract one-commodity world (Rogers 1989: 22). Rogers reviews the Cambridge capital controversy (Rogers 1989: 30–39), and notes the problems with the aggregative (Wicksellian) neoclassical production function (Rogers 1989: 30–32). (1) the problems with the treatment of capital in the neoclassical production function Q = f(K,L), and the circularity involved in defining the quantity of capital K, when to determine K one needs to know the rate of interest, but to determine the rate of interest one needs to know the value of capital K (Rogers 1989: 31). The upshot is that K cannot be an exogenous variable in the production function. (4) capital reswitching (Rogers 1989: 32). (2) those neoclassical economists who use a methodological defence of the neoclassical production function and Wicksellian general equilibrium theory applied to a one commodity world, which is supposed to be a useful pedagogical tool or “parable” teaching fundamental ideas of neoclassical interest theory, although it is untrue that such an unrealistic and empirically irrelevant model has any great lessons to teach (Rogers 1989: 34). (3) those neoclassical economists who simply accept the neoclassical production function “on faith” (Rogers 1989: 33, n. 7). Now the Classical loanable funds model of interest is supposed to relate how interest in a monetary economy still reflects the real forces of productivity and thrift (Rogers 1989: 40). But in a monetary economy the act of saving money does not necessarily reflect real saving (Rogers 1989: 42). The only viable model in which the Wicksellian neoclassical interest theory is possible is one which assumes a one commodity world where that single commodity can function either a capital good or a consumption good (Rogers 1989: 32, n. 6). The natural rate can only be defined in a one commodity world, but not in a world with heterogeneous capital goods (Rogers 1989: 32, 43). The consequence is that only the monetary rate of interest in the loanable funds model is left after the untenable natural rate is cut out, and that the money rate of interest is cut free of the real forces of productivity and thrift (Rogers 1989: 43). 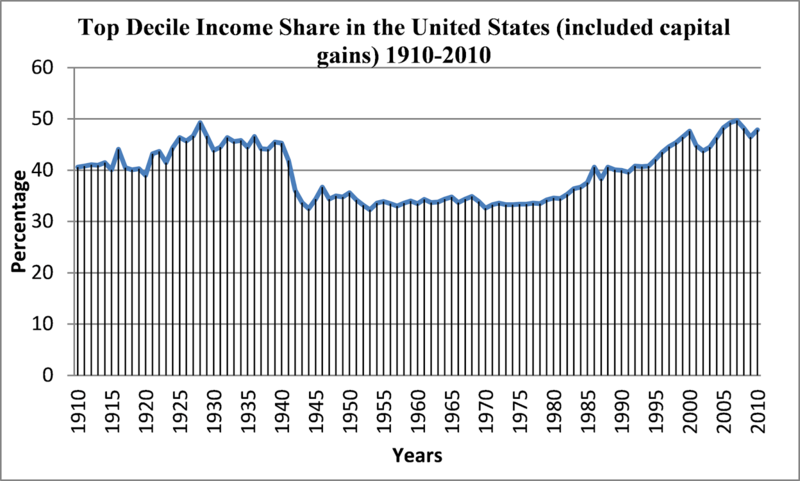 An interesting graph of the top decile income share in the United States from 1910–2010 from Piketty’s data here. As we see, since 1981 the top 10%’s wealth has soared back to the level it was at in the 1920s, and a major cause, though not the only one, was Reagan’s changes to the tax system which made that system substantially less progressive. The process is illustrated by changes to the top marginal tax rate. From 1933 to the early 1940s the top marginal tax rate was progressively increased from about 60% to about 90%, and stayed at 90% until the Kennedy–Johnson tax cut of 1964 reduced it to 70%. Even with this, the minor fluctuations from 1945 to the early 1981 are within the band of 32%-36% and showed no long-run trend upwards but relative stability until the early 1980s. Libertarians are fond of railing against so-called “soak-the-rich” tax systems, and yet from the 1940s to 1981 the US had a tax system with large progressive taxes on high individual income. But those high taxes rates were consistent with very strong economic growth in that era: in fact, if we ignore the World Wars, the best decadal per capita GNP growth the US ever had, in the period from 1871 to 2001, was in the decade from 1961 to 1970. Then under Reagan’s presidency the top marginal tax rate was reduced to 50% in the Economic Recovery Tax Act of 1981 and to 30% (in 1988). Further adjustments were but minor and only changed this rate in a range from 30 to 40%, as can be seen in the data here. (1) Galbraith, James K. 2014. “Policy, not capitalism, is to blame for the income divide,” May 26, Ft.com. (2) Galbraith, James K. 2014. “Kapital for the Twenty-First Century?,” Dissent, Spring. Philip Pilkington, “Piketty’s Regressive Views on Public Debt and the Potential Impact of his Book,” Fixing the Economists, April 30, 2014. Philip Pilkington, “Why Thomas Piketty is Wrong About Inflation and Interest Rates,” Fixing the Economists, May 16, 2014. And it is easy to demonstrate so, and I expand below on an old post of mine. First, Rothbard did not attempt to justify his natural rights ethics by means of theology (Rothbard 2002: 4), so this need not detain us. “Let us turn then to the natural-rights basis for the libertarian creed, a basis which, in one form or another, has been adopted by most of the libertarians, past and present. ‘Natural rights’ is the cornerstone of a political philosophy which, in turn, is embedded in a greater structure of ‘natural law.’ Natural law theory rests on the insight that we live in a world of more than one—in fact, a vast number—of entities, and that each entity has distinct and specific properties, a distinct ‘nature,’ which can be investigated by man’s reason, by his sense perception and mental faculties. Copper has a distinct nature and behaves in a certain way, and so do iron, salt, etc. The species man, therefore, has a specifiable nature, as does the world around him and the ways of interaction between them. To put it with undue brevity, the activity of each inorganic and organic entity is determined by its own nature and by the nature of the other entities with which it comes in contact. Specifically, while the behavior of plants and at least the lower animals is determined by their biological nature or perhaps by their ‘instincts,’ the nature of man is such that each individual person must, in order to act, choose his own ends and employ his own means in order to attain them. Possessing no automatic instincts, each man must learn about himself and the world, use his mind to select values, learn about cause and effect, and act purposively to maintain himself and advance his life. Since men can think, feel, evaluate, and act only as individuals, it becomes vitally necessary for each man’s survival and prosperity that he be free to learn, choose, develop his faculties, and act upon his knowledge and values. This is the necessary path of human nature; to interfere with and cripple this process by using violence goes profoundly against what is necessary by man’s nature for his life and prosperity. Violent interference with a man’s learning and choices is therefore profoundly ‘antihuman’; it violates the natural law of man’s needs.” (Rothbard 2006 : 26–27). (1) It is untrue that “since men can think, feel, evaluate, and act only as individuals, it becomes vitally necessary for each man’s survival and prosperity that he be free to learn, choose, develop his faculties, and act upon his knowledge and values.” Rothbard is claiming a moral necessity here. He is deducing a morally necessary “ought” from an “is,” a deduction which, as Hume showed, is impossible to justify. But putting that aside for the moment (more on it later), even his reasoning is faulty. Take a clear example: all human beings begin life as children and nearly always subject to the coercion of their parents who impose rules, deprive them of the freedom to do anything they want, and at the same time choose to impart knowledge and values to their children. Children can and do survive and flourish while being subject to quite severe parental constraints and rules. For example, if one is raised Catholic, one did not give one’s consent when a child to be raised with Catholic values and religion: the choice was made by the parents, but one may well become a moral, successful, and prosperous human being, despite that parental coercion in knowledge and values. There are even adults who prefer to let others choose their ends. Certain mentally impaired human beings can survive and even flourish even though they are subject to strict control by their carers. On the contrary, human beings do possess “automatic instincts”: hunger, thirst, and a vast range of genetically determined behavioural traits. To take one example: human children have a genetic predisposition to acquire language as naturally as a bird grows its feathers. (3) Rothbard and the “is-ought” problem of David Hume. This is subject to Hume’s “is–ought problem,” or at least one important interpretation of it that is compelling. When a person argues that some moral “ought” statement is necessarily true and entailed by some prior descriptive facts, there are insuperable difficulties with defending such moral necessity. Remember that the “ought” here entails a necessity in the truth of the moral statement. How is it possible to deduce with necessary truth the prescriptive/normative statement “violent interference with a man’s learning and choices is therefore profoundly ‘antihuman’” from mere descriptive statements? Just because the nature of a leaf (or really its propensity to do certain things under natural laws) is to fall to the ground under the influence of gravity, it simply does not follow that we have deduced with necessary truth that the leaf has any moral right whatsoever to fall to the ground. Hume’s “is–ought problem” is a profound and devastating one for natural rights theorists and indeed for anyone who thinks that he can necessarily deduce moral truths from natural facts. “The most viable method of elaborating the natural-rights statement of the libertarian position is to divide it into parts, and to begin with the basic axiom of the ‘right to self-ownership.’ The right to self-ownership asserts the absolute right of each man, by virtue of his (or her) being a human being, to ‘own’ his or her own body; that is, to control that body free of coercive interference. Since each individual must think, learn, value, and choose his or her ends and means in order to survive and flourish, the right to self-ownership gives man the right to perform these vital activities without being hampered and restricted by coercive molestation. Consider, too, the consequences of denying each man the right to own his own person. There are then only two alternatives: either (1) a certain class of people, A, have the right to own another class, B; or (2) everyone has the right to own his own equal quotal share of everyone else. The first alternative implies that while Class A deserves the rights of being human, Class B is in reality subhuman and therefore deserves no such rights. But since they are indeed human beings, the first alternative contradicts itself in denying natural human rights to one set of humans. Moreover, as we shall see, allowing Class A to own Class B means that the former is allowed to exploit, and therefore to live parasitically, at the expense of the latter. But this parasitism itself violates the basic economic requirement for life: production and exchange.” (Rothbard 2006 : 28). The first problem with this argument is that ownership and private property in the sense defined by Rothbard (and this point is crucial) are not even natural concepts. You do not naturally “own” your body in the sense in which Rothbard defines the word: but you do possess/have a body as a consequence of genetic and biological processes. But ownership rights and private property rights even as moral concepts are socially constructed concepts and, in any sufficiently complex society, legal concepts too, not natural concepts. That human beings qua natural human beings (and not malformed or severely injured human beings, for instance) possess bodies is an empirical fact, as we have seen. It is clear that Rothbard uses “own” in a special moral sense here. For if “own” merely means “possess” or “have,” then one can no doubt say that human beings who possess bodies own (= possess or have) bodies, but this is a tautology and a trivial truth. Furthermore, Rothbard’s claim that there are only “two alternatives” to denying each man the right to own his own person is manifestly false, as is shown by Edward Feser (“Rothbard as a philosopher,” August 8, 2009). For example, some types of consequentialism argue that morality aims at certain ends, and that the logic of moral argument can only be an inductive logic, not a necessary deductive logic. That is to say, it is correct that no moral “ought” statement is necessarily implied by descriptive facts, but a statement urging certain actions to achieve certain ends may well be inductively implied by descriptive facts in a probabilistic sense only. What we call “ethics” is essentially the inductive logic of arguments about how to achieve certain ends. Even the ultimate ends that we should aim at can be justified with rational argument, empirical evidence and inductive argument (and I have sketched my own consequentialist ethics here, on the basis of the theory called prescriptivism). So what is the consequentialist view of human rights and rights to property? Under consequentialism, what human beings can have is a non-necessary moral right to a high, but not absolute, degree of freedom from coercive interference and a high, but not absolute, degree of freedom of control over external property. In order to achieve certain ends, we must accept restrictions on both personal property rights and behaviour. “We have established each individual’s right to self-ownership, to a property right in his own body and person. But people are not floating wraiths; they are not self-subsistent entities; they can only survive and flourish by grappling with the earth around them. They must, for example, stand on land areas; they must also, in order to survive and maintain themselves, transform the resources given by nature into ‘consumer goods,’ into objects more suitable for their use and consumption. Food must be grown and eaten; minerals must be mined and then transformed into capital and then useful consumer goods, etc. Man, in other words, must own not only his own person, but also material objects for his control and use. How, then, should the property titles in these objects be allocated? The main point, however, is that the case of the sculptor is not qualitatively different from all cases of ‘production.’ The man or men who had extracted the clay from the ground and had sold it to the sculptor may not be as ‘creative’ as the sculptor, but they too are ‘producers,’ they too have mixed their ideas and their technological know-how with the nature-given soil to emerge with a useful product. They, too, are “producers,” and they too have mixed their labor with natural materials to transform those materials into more useful goods and services. These persons, too, are entitled to the ownership of their products.” (Rothbard 2006 : 36–39). Bees use their labour to collect nectar from flowers: they now have a morally necessary natural right to the nectar! Then honeybees return to the hive and give their nectar to worker bees. These bees labour by regurgitating the nectar and making honey from it (through the action of enzymes), and they then use their labour to store the honey in honeycombs. It follows from this that bees own their honey and have the absolute natural right to not be aggressed against and have their honey stolen by other animals and humans! If Rothbard’s natural rights arguments were true, then it would be a grossly immoral act for any human being to take honey from wild bee hives, and saying that a person used their labour to coercively collect the honey so that he “homesteaded” it does not overcome the problem: for then I could claim that the labour expended by a thief in robbing someone was a legitimate way to own the victim’s property. Clearly, this does not work under Rothbard’s ethics. Another response would be that natural rights only apply to human beings: but even this does not succeed, for if no non-human, living thing has any absolute natural right to self-ownership and ownership of external things, then why should human beings? Why the double standard? The answer to these various moral conundrums is of course that Rothbard’s natural rights theory is nonsense. But what would a consequentialist say about this? Can we take honey from bees morally, given that the bees mixed their labour with the honey? The answer is “yes,” because no living thing has any necessary moral right to its external property in the first place. Is it always moral to take honey from bees? Though it would have to rank low on the list of moral question humans must face, consequentialism can provide better answers than Rothbard’s natural rights ethics and its incoherence. If a human being, for example, has no pressing need for food and destroys a hive and takes all the honey leaving the bees with no food and to suffer and starve, then one can make a consequentialist case that this is immoral. But here it would be immoral because we have to keep in mind the consequentialist aim of minimising the harm and suffering we cause to other living things (of course, even here empirical questions arise: is the animal in question conscious? Does it feel pain? Can it suffer?). But fortunately most bee-keeping is not like this and such moral questions do not normally arise and, as noted above, even if they did would be low on our list of moral questions: for most beekeepers take a certain amount of the honey and leave the hive enough to survive and sometimes even provide the bees with sugar or corn syrup if necessary. Yet another issue arises with animals: say you acquire fertilised chicken eggs and through your labour create chickens. Does it follow you have an absolute natural moral right to the animals, even to the point of torturing them and mistreating them? Is it immoral for another human being or the community through its laws and legal system to use non-lethal and limited coercion to stop you in your mistreatment? The absurd natural rights ethics of Rothbard says “yes,” the consequentialist rightly says “no,” because (1) you never had any absolute natural right to ownership of the animals in the first place and (2) greater moral issues arise when human beings own living things that can feel pain and suffer. In short, with these examples, we see how Rothbard’s natural rights ethics leads to incoherence in the first instance, and moral bankruptcy in the second, and that consequentialism is superior. It is difficult to see how using one’s labour to create something makes the thing in question an “extension of [sc. the] … personality” of the labourer. Even if did, it would still not follow that any necessary natural moral right to the created thing is created. For example, are children the absolute property of parents, merely because parents have engaged in labour to create the children? In conclusion, the foundation of Rothbard’s natural rights ethics is utterly flawed, incoherent and dependent on logical fallacies long known in the history of philosophy. Feser, Edward, “Rothbard as a philosopher,” August 8, 2009.